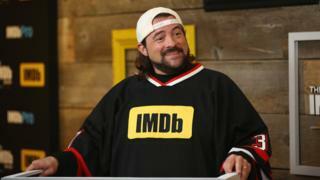 Filmmaker and actor Kevin Smith says he suffered a "massive" heart attack after performing on stage - and that he had accepted he was about to die. Smith, the director of Clerks, Mallrats and Red State, had finished one of two shows when he fell ill on Sunday. The 47-year-old was rushed to hospital and says doctors found one of his arteries was 100% blocked. "I faced my greatest fear tonight...and it wasn't as bad as I've always imagined it'd be," he wrote. In an Instagram post written from his hospital bed in Los Angeles, Smith said he was reminded of his father, who died after a heart attack. "I was filled with a sense of calm. I've had a great life: loved by parents who raised me to become the individual I am," he wrote. "I've had a weird, wonderful career in all sorts of media, amazing friends, the best wife in the world and an incredible daughter who made me a Dad. But as I stared into the infinite, I realized I was relatively content." He paid tribute to hospital staff who diagnosed a blocked LAD artery - the main artery running down the front of the heart. Such a blockage can often lead to death, and is fatal in a high percentage of cases. "I'm sure I'll be facing some lifestyle changes now," he wrote, adding that maybe it was time to become vegan. Smith was first seen in his 1994 comedy Clerks, which he filmed for about $27,000 (£19,000) in his native New Jersey. The film went on to win prizes at the Cannes and Sundance film festivals.